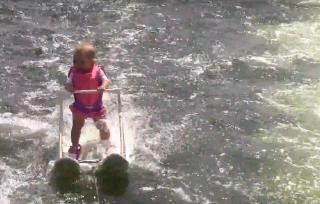 (Newser) – A 6-month-old girl whose professional water-skier parents put her on junior-size water skis last week glided 686 feet across a man-made lake in what her parents say sets a youth record, the AP reports. Keith St. Onge said his daughter Zyla could have kept going if the boat hadn't reached the end of the lake. The 30-inch, 20-pound Zyla, who doesn't yet walk, skied across Lake Silver in Winter Haven, Florida, last Thursday. A video of her skiing was posted on YouTube. She stood on tiny water skis that were attached to each other by wood. She gripped a handle bar attached to the skis that looks like a walker someone with mobility problems might use. She wore a life jacket as a boat pulled her at a speed of 7mph. Not the smartest thing to do with a child that can't stand up on their own. The parents are a little to over obsessed with water skiing. Lakes in Florida = alligators. I should know, I live on a lake and there's one sun bathing on the shore opposite. I'm all for babies learning how to swim, especially if you live in Florida. Little kids drown in canals, lakes and pools almost daily. Baby drownproof swimming lessons are given at the Y's and public parks and pools. But water skiing is something else entirely, and baby water skiing in a fresh water lake adds a whole extra dimension of danger.